I have a list of books on books that I want to read, and I finally got to read this one today. I read the electronic version but I would love to get my hands on a print copy for keeps. The book is non-fiction. It consists only of letters that spanned 20 years between a bibliophile scriptwriter in New York with a buyer in a bookstore in London. 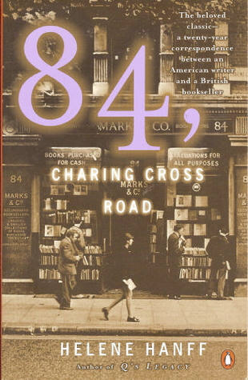 It began with Helene Hanff, the American scriptwriter who wrote the first letter in 1949 to Marks & Co., Booksellers at 84, Charing Cross Road, London. She was soon corresponding with the book buyer Frank Doel, some of the staff in the bookstore, even Frank's wife, daughter and neighbour. It's been called a "charming record of bibliophilia, cultural difference, and imaginative sympathy," what with the entertaining correspondence between an outspoken New Yorker and a restrained Londoner or what she referred to as one with "proper English reserve". I don’t look anywhere else any more. Why should I run all the way down to 17th St. to buy dirty, badly made books when I can buy clean, beautiful ones from you without leaving the typewriter? From where I sit, London’s a lot closer than 17th Street. My friends are peculiar about books. They read all the best sellers, they get through them as fast as possible, I think they skip a lot. And they NEVER read anything a second time so they don’t remember a word of it a year later. I personally can’t think of anything less sacrosanct than a bad book or even a mediocre book. Like the people who win our hearts, the books we come to love can introduce themselves in the strangest ways. ...this lovely volume reveals an awful lot about what books provide: a way of reaching out across time and space to friends and strangers, and to the absent presences that play such a large part in all our lives.